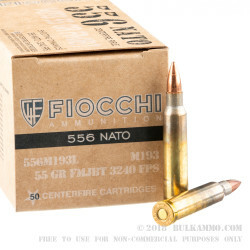 Fiocchi’s Shooting Dynamics line of ammunition is poised to give exceptional performance to high volume shooters who’d rather not pay a lot for the privilege of enjoying their rifles all day at the range. 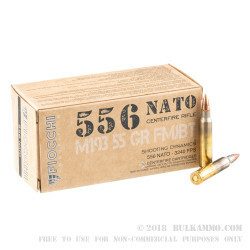 This 5.56x45 cartridge accordingly offers high quality components, including its factory fresh and reloadable brass casing, clean burning propellant that produces a consistent muzzle velocity of 3,240 fps, and non-corrosive primer that needs only the faintest input of a firing pin to do its job well. 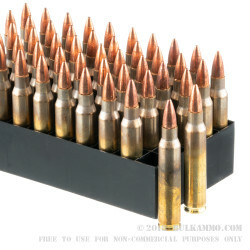 This cartridge dons an M193 projectile. 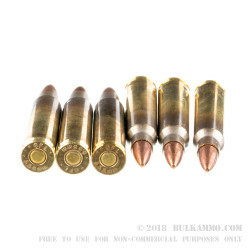 Its bullet therefore is comprised of a lead alloy core with a gilded metal jacket, so it feeds without issue and fouls very little when fired. This bullet’s boat tail design assures its high ballistic coefficient, and improves its accuracy by granting it superior resistance to wind drift, flattening its trajectory, and letting it retain a greater amount of its velocity downrange.